Artists need to create for creation’s sake. But they also need to support their families. In our current culture, an artist who wishes to do the latter needs to forego part of the former and created for the sake of commerce. In other words, no one’s going to pay you to paint something that can’t be sold. This hasn’t always been the case. Once upon a time, as it were, those with means would provide patronage for the arts. A talented artist could find those who would invest in not just the product of his or her labor, but in both allowing them to flourish… and to support themselves and their family. Yes, there would be strings attached – a painter would be expected to provide paintings here and there to his patron – but there was a viable and mutually beneficial arrangement at the core. This is why AggMedia provides free hosting and web services for singer/songwriter/ actor/director (and more!) Cory McAbee. We believe in his art. We take joy from it. And, as such, we have a vested interest in making sure that he can make art that we can enjoy in the future. All of this brings us to you. You too can be a patron in the older sense of the word. Support Cory (and other artists) at Patreon. Help them have the time and freedom to make art without having to chase commerce in order just to make ends meet. Support art by supporting artists. It doesn’t take much and the world will be better for it. Friend of Aggmedia Kanen Flowers will be speaking again at the July BOSCPUG meeting. Adobe worldwide evangelist Terry White is coming to Boston – joined by Chris Georgenes and the return of KANEN FLOWERS. Join us to see the latest in Adobe Creative Cloud since CS6. Learn new features that make everyday tasks easier and faster and how support for cutting-edge hardware and standards will free you to build anything you can imagine. Get answers to your questions and get inspired by designers who are creating amazing work. 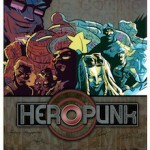 Director Kanen Flowers will debut the trailer for his sci-fi feature HERO PUNK at the May 22nd BOSCPUG meeting. KANEN FLOWERS of ThatStudio.com “From Script to Screen on 18:20 and HERO PUNK” including the world premiere trailer screening of HERO PUNK. 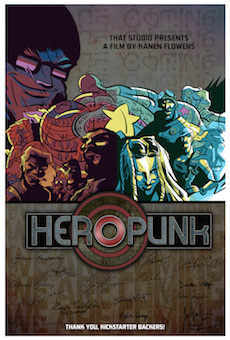 AggMedia’s Maggie McFee designed the logo for the film and also created the poster using elements from artist Garrett Richert‘s Hero Punk GN designs. I only know Juan from Twitter, but he’s an interesting dude. Click here for event details. Renowned colorist and Digital Intermediate artist Juan Salvo will walk us through the technology and technique of creating your own DCP – or Digital Cinema Package – for your film project. He’ll explain what color spaces are, why they matter, and have straight forward tips you can use to make your own Digital Cinema Packages – and prep your films to screen and look their best when you enter the film festival circuit and distribute your project! The 3rd annual CPUG Supermeet is November 9th, 2012 at the Revere Hotel. Our pal Kanen Flowers (of Scruffy.TV, RI4E’s network) will be speaking about many things including show sponsor Adobe CS6 and PluralEyes. And other pals the Diamond Brothers from HIdden Fortress will also be on-hand to talk about the BlackMagic Cinema Camera. ALl three are interesting guys. Should be a fun night. Ticket can be had from Supermeet.com. Marian Call performing ‘Dark Eyes’. Shot live last November at Tommy Doyles. The FCPUGnet Supermeet finally comes to Boston on Friday, June 25th from 5pm until 11pm. If you’ve wanted to attend a Supermeet but couldn’t justify flying out to one, now is your chance! After finishing a shoot of NECSS 2010 (http://necsscon.org), we went backstage and came upon James Randi talking to an attendee about the art of illusion. Enjoy. This post from Tyler Ginter is definitely a worthwhile read if you’re at all interested in digital video cameras and obtaining that ‘filmic’ look. It’s especially relevant if you have a DSLR that shoots video or a camera which allows you to adjust the shutter. New Apple Xserves – Compelling or Commonplace? admin | April 8th, 2009 | Comments Off on New Apple Xserves – Compelling or Commonplace? Apple has finally unwrapped their new series of Xserves to incorporate the new Nehalem CPU line and, one would imagine, to add new features in line with current trends and technologies. What is new and compelling? A ‘free’ SSD slot separate from the three internal 3.5″ SATA bays. A very nice addition, indeed. The offered 128GB SSD can decrease boot (and reboot!) times and reduce or eliminate bottlenecks resulting from OS wait time. On-board graphics (GeForce GT 120 w/ 256MB). There’s no slot taken up and/or no card to add/remove. Don’t scoff! Your GPU will become very important, even on your servers, very soon. OpenCL is right around the corner. This is ‘free’ processing power. “Lights Out” power management via an independent service processor. Green it up, y’all. Lower power-to-performance ratio is claimed. Partly from the new CPUs and partly from engineering changes. Touted as an overall ‘greener’ product. 10.5 Leopard Server with unlimited client license included. Given what’s inside the base model… well, it’s still a little spendy. The base 8-core system is $3599 with a paltry 3GB RAM and 160 HDD. The base 4-core system just doesn’t excite me at all. In fairness, these are Nehalem CPUs which have only just hit the open market, so you will pay a premium to live on the bleeding edge. Redundant power supplies still not standard. Although $200 to add one isn’t too bad, it’s really time that a $3500 base box has it standard. Of course, two power supplies means having to publish a higher idle power usage and overall lower energy efficiency rating… So marekting’s probably not crazy about the idea. No. Effing. eSATA ports. Two Firewire 800 ports are as close as you get (and 3 USB2 ports for… a keyboard or whatever). Not so bleeding-edge… Now that Apple is out of the drive rack business, why do they care what we hang off these boxes? Give us some options here. Firewire 800 is nice to have for backups/restores/dumps, but it’s speed-limited. Yes, you can add a internal card, but we really should have at least one eSATA port standard by now.